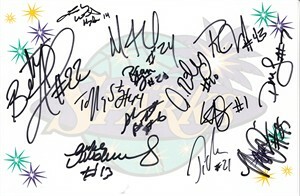 5 1/2 by 8 1/2 WNBA Los Angeles Sparks logo card autographed in black marker by 13 members of the 2010 team (preseason roster) including stars Betty Lennox, Delisha Milton-Jones, Ticha Penicheiro and Noelle Quinn. Obtained in person, with certificate of authenticity from AutographsForSale.com. ONLY 2 LEFT.